Remember the app Dark Sky? If you’re outside the U.S., what you’ll remember is the frustration of not being able to use its amazing real-time rain warnings, which would literally tell you when it would rain on your location in the next hour or so. 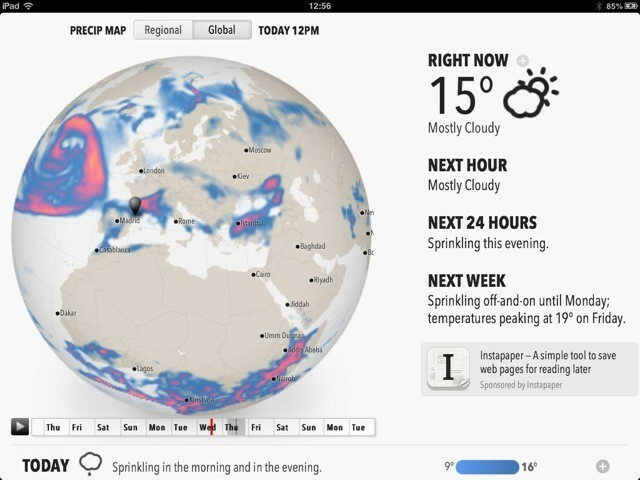 Now, the developers of Dark Sky have come out with Forecast, which works anywhere in the world, and will run on Android, iOS, the desktop, anywhere. How? It’s a web app. 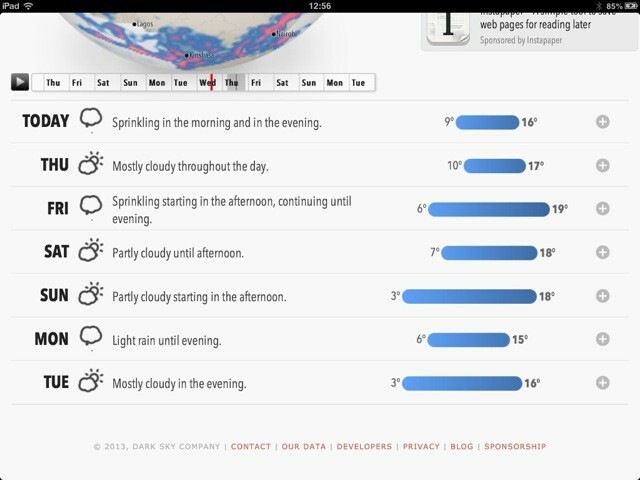 Forecast is just about the slickest weather app I have seen, and it is all the more amazing for being a web app. It uses location services to localize its forecast, and shows the results as both a beautiful animated globe (or more local map) and a list of daily summaries, complete with easy-to-read temperature graphs and animated weather icons. Visually, it’s fantastic. And yes, you can get the cool, trademark precipitation animation, although rain warnings aren’t available – likely due to the same lack of data which stopped Dark Sky from having them outside the U.S.
And let’s not forget the one super-cool feature: A time machine. This lets you see the weather for your currently-selected location at any time in the past. Well, any time for which data is available anyway, which seems to rule out my date of birth, lost in the mists of time. A few other notes: Forecast is a proper web-app, and on iOS it has a great icon for when you save it to the home screen, along with running as an “app,” without an address bar. You can also save various locations, and choose between the fun, old-fashioned Fahrenheit scale or the modern, get-with-the-rest-of-the world-already Celsius scale.